I have a gut feeling that Lavva Yogurt is exactly what many of you have been looking for. It’s a unique dairy-free blend that has absolutely no added sugars, contains natural prebiotics, and packs in 50 billion live probiotics per serving. 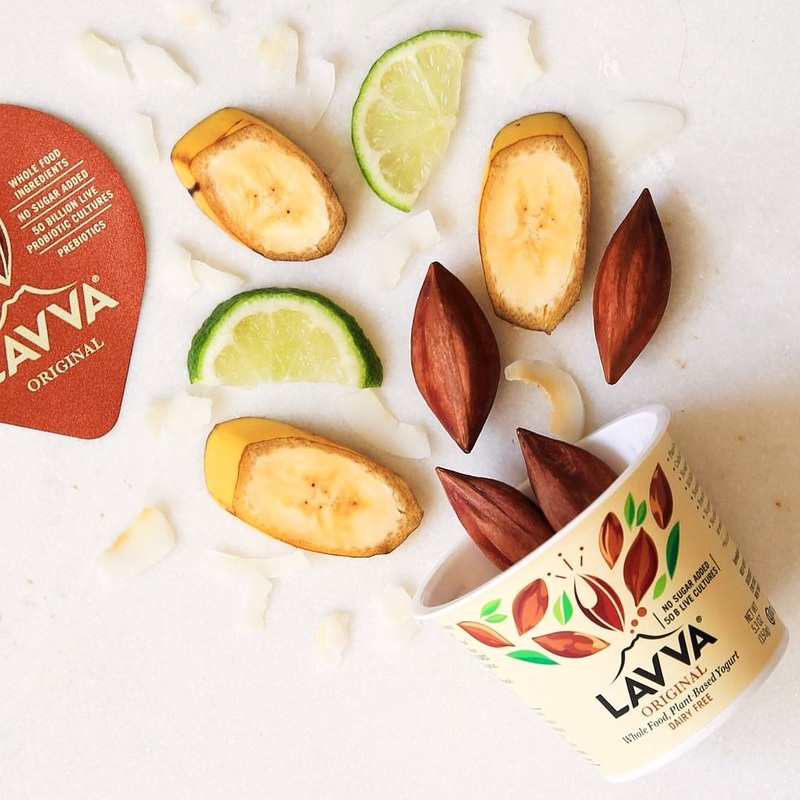 Lavva Yogurt comes in several flavors, and is made with a base of coconut, pili nuts, and plantains. Coconut provides the creamy finish, plantains offer body and prebiotics, and the pili nuts add richness, minerals, and amino acids. Thanks to this magical combination, Lavva Yogurt is free of carrageenan and gums. It’s also made without any artificial additives, flavors, or colors. Consequently, it suits vegan, paleo, and Whole30 diets. 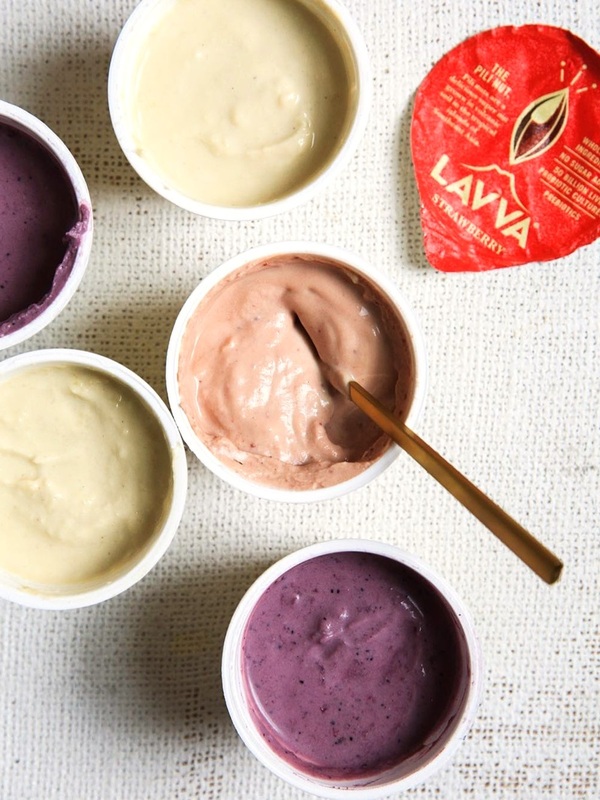 I just discovered Lavva Yogurt, and it’s the best dairy-free yogurt I’ve ever tasted! It actually has a “tang” like dairy yogurt. I’ve tried every brand I can get my hands on and many are good, but they taste like pudding. This tastes like yogurt should taste. The original flavor has been a lifesaver. Lots of recipes call for plain yogurt, but most dairy free alternatives have some kind of distinct flavor. I can get away with using vanilla for sweet recipes, but the plain Lavva works very well for savory sauces. I just tried the original, and while I appreciate the “no added sugar,” it was AWFUL. It has a grainy texture that I just could not stomach. I threw it away. So far, it’s the worst non-dairy yogurt I’ve tried since going vegan a few months ago. If you have tried Lavva Yogurt, please comment on this post with your tasting notes. It helps others, too! Ingredients – coconut water, organic coconut cream, plantains, pili nuts, organic coconut powder, organic cassava root powder, organic lime juice, Himalayan salt, live vegan probiotic cultures*. Ingredients – coconut water, organic coconut cream, organic strawberries, plantains, pili nuts, organic coconut powder, organic cassava root powder, organic lime juice, Himalayan salt, live vegan probiotic cultures*. Ingredients – coconut water, organic coconut cream, organic raspberries, plantains, pili nuts, organic coconut powder, organic cassava root powder, organic lime juice, Himalayan salt, live vegan probiotic cultures*. Ingredients – coconut water, organic coconut cream, organic blueberries plantains, pili nuts, organic coconut powder, organic cassava root powder, organic lime juice, Himalayan salt, live vegan probiotic cultures*. Ingredients – coconut water, organic coconut cream, organic pineapple, plantains, pili nuts, organic coconut powder, organic cassava root powder, organic lime juice, Himalayan salt, live vegan probiotic cultures*. *The dairy-free probiotic cultures used in Lavva Yogurt are L. Plantarum, S. Thermophilus, L. Bulgaricus, L. Acidophilus, Bifidobacterium Ssp. (B. Bifidum), L. Rhamnosus, and L. Delbrueckii. Price: $2.69 per 5.3-ounce single-serve cup and $6.99 per 16-ounce multi-serve tub. Availability: Lavva Yogurt is slowly rolling out in Whole Food stores and other grocers across the U.S. But their best distribution is in the North East. Certifications: We did not note any certifications for Lavva Yogurt. Dietary Notes: By ingredients, Lavva Yogurt is dairy-free / non-dairy, egg-free, gluten-free, grain-free, peanut-free, soy-free, vegan, plant-based, vegetarian, paleo-friendly, whole 30 approved. But check with the company on their manufacturing processes for all varieties if potential allergen cross-contamination is an issue for you. Processes and labeling are subject to change at any time for any company / product. For More Product Information: Visit the Lavva website at lovvelavva.com. I’ve tried the Strawberry, Raspberry and Pineapple. The pineapple is amazing and the others not so much. The strawberry one is especially bitter but the pineapple is just the right amount of sweet. If you love to taste grit and tanginess at the same time this is for you! Can’t see myself buying this again! Best vegan and sugar free yogurt I’ve ever tried. I’ve only tried the plain version, so I can’t speak to their flavored yogurts. But the plain is thick and creamy, slightly tangy, the perfect amount of sweet. It’s not runny like a lot of yogurts; it’s not overly sour like a lot of plain yogurts. It seriously is incredible, miles above any other non-dairy yogurt (or even most dairy yogurts) I’ve had. The taste off the plain yogurt is good. Very expensive and yet the plastic cover is super cheap and hard to remove. Why not use a better grade? I bought this at Whole Foods because they were out of Anita’s Coconut Milk Yogurt. I am a gluten free, sugar free Vegan. I was a bit put off by the color but really wanted another breakfast option. It is tangy but I feel that is part of eating yogurt. I wanted to up the protein content so I put in my food processor with some marine collagen and frozen wild blueberries and topped with whole blueberries and toasted coconut. Delicious!! So I just discovered Lava yogurt. I didn’t realize we sold it here at my job but when I saw the mango (my favorite flavor) I just had to try it. It was so good I went back and tried the pineapple. Needless to say neither flavor was a disappointment. I am definitely a “fan” and now prefer Lava over any other brand. The vanilla flavor is really good. I recently cut out all dairy, processed sugar, and gluten due to an autoimmune diagnosis. It only recently occurred to me that I was no longer getting the probiotics I had been consuming for years eating traditional yogurts and many autoimmune disorders are directly related to gut health. Most plant-based yogurts or water-based Kefirs do not contain 50 billion live probiotic cultures. For me this is a win. The taste and texture of the vanilla I like. It has more of a kefir taste than a yogurt taste, which I don’t mind but could see where others would be put off. Protein is usually quite high in yogurt and this is relatively low but again my goal was increased probiotics, non-dairy, and no added sugars. I’m a fan so far. I bought it at Whole Foods and didn’t find it overly expensive. I tried the strawberry, and immediately checked the expiration date because I thought it had spoiled. After reading some of the reviews, I see other people felt the same way. The sour taste is out of control. Totally inedible!!!! I can’t even comment on the texture, which I didn’t notice because the taste was overwhelmingly disturbing. How is this on the market? It’s hidious!! I bought 3 other flavors, but I intend to return them to Whole Foods. I LOVE THIS YOGURT!!!! The plain is the best. I tried the strawberry and the tanginess (which i love in most cases) overpowered the strawberry flavor. However the plain is awesome. I love tangy yogurt and this hits the nail on the head. Reminds me of a thinner version of skyr in terms of tang. Not sure what one person was talking about as far as grittiness goes, maybe just their particular batch or a flavored variety but the plain and the strawberry had NO grittiness. Completely and lusciously smooth. 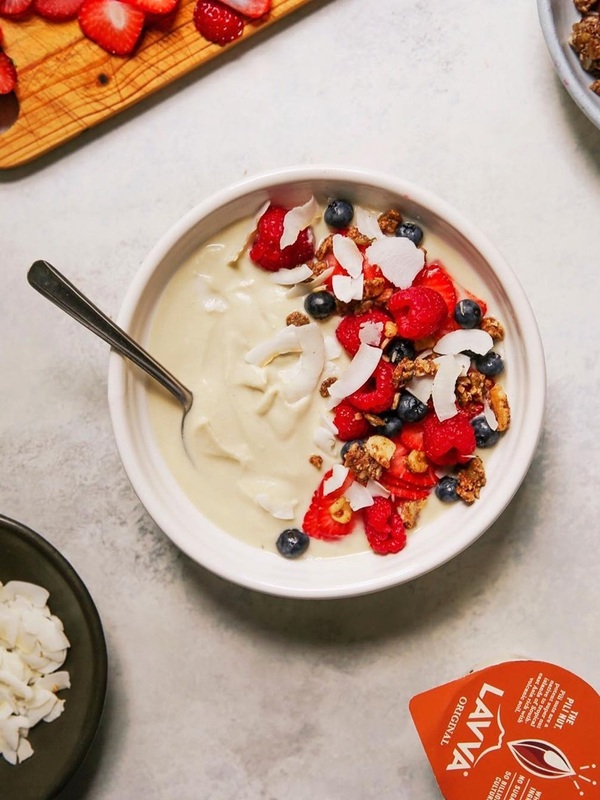 I am mostly paleo although I consume grains in moderation as a treat but I’m strictly dairy free, organic, and clean ingredient eating as much as possible and Lavva has been one of the only yogurts to hit the mark. In the 16 oz tubs I can justify the purchase because I like it so much. The other yogurt I’ve tried and love is Anita’s but the cost is way too high so I had to stop buying. My favorite old way of eating yogurt was with a dash of honey and that’s what i do to doctor up the plain. I add a touch of honey, some fruit (cherries right now are my fav) and hazelnuts with a pinch of vanilla powder. DELISH! Tried the raspberry. The texture was fine after dumping some of the liquid out. However, the taste was a bit too salty and too sour for me. I like my yogurt tangy but this was too much. And why put salt in it?? I found this at Whole Foods, and I was so happy to find a new vegan “yoghurt” choice, but then I tasted it. OMG, this is TERRIBLE! It tastes like someone spilled cornmeal and mustard in it. I thought the blueberry that I started with had gone bad, so I tried the strawberry–it was creamier, but nearly as inedible. I passed it around to three other family members, and no one survived. From five years old to fifty, the opinion was unanimously against this product. I honestly cannot imagine how this is considered desirable in any way other than on paper. Reality is a different story entirely. Thanks for sharing your feedback on this Piley and for giving me a giggle! Cornmeal and mustard? Now that is interesting. I have recently gained interest in consuming less dairy, and with that, found this dairy alternative yoghurt. While I understand it will never replace traditional yoghurt with dairy, the zest in this yoghurt, from the lime I am assuming, is inedible. I could not even close my mouth when I was chewing, it was just way too sour. It’s such a pity because I didn’t mind the texture, but I won’t be trying this again. I tried the raspberry flavor. I do appreciate the no sugar as most yogurts, dairy or non-dairy, are loaded with sugar. However, I found the Lavva to be inedible. It has a weird grainy texture and an earthy taste I just couldn’t stomach, even with fruit and nuts added. I threw it away after a couple of bites. It is honestly the WORST non-dairy yogurt I’ve tried since going vegan. I’ve never tried this yogurt, but it looks delicious! All of the flavors sound amazing, but especially the Pineapple flavor. Yum! Will have to try it! Sounds and looks so delicious! I’ll have to try this yogurt soon! No added sugar?! Yogurts, dairy and nondairy are always packed with added sugars so these are amazing!!! I haven’t seen this one yet. I’ll have to check it out and see if I can find it and give it a try as we’re still on the hunt for one that my oldest loves. I’m on the hunt for it too! Thanks for chiming in on this Virginia! I agree on the price – I haven’t found it in my local area yet, But $2 or more for a single dairy-free yogurt always makes me think twice.